I love wearing bracelets, so here’s what I’ve been up to lately. I added these to my Etsy shop, The Little Blue Trunk, this morning. I used a couple of vintage buttons to tie off the red one and a gigantic vintage bead for the gray one. Then I used some leftovers to make this wrap bracelet to go with the gray. It looks good paired with the chunky gray crochet. 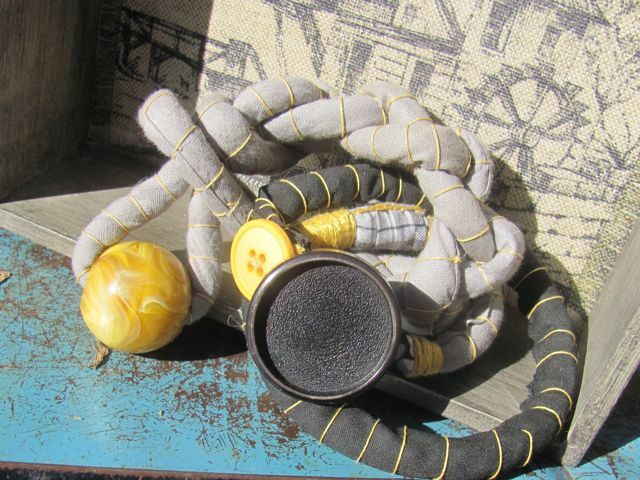 I used bias tape on piping cord, some of it rescued from an ugly pillow. They are assembled with crochet thread and pearl embroidery thread. I bought the embroidery thread new, but everything else is made with rescued and recycled materials. I have a few more to finish and photograph: a blue, red and gold paisley, medium blue with huge mother of pearl button, light purple and a skinny charcoal gray wrap. Be sure to follow my Etsy shop to see the new ones when I finish them. I’ll be adding bling to the ones I make next, beads and vintage jewelry will turn up the heat. Tell me what colors you’d like to see these in. They sky’s the limit! I’ve been on the lookout for some plain old-fashioned cloth pot-holders the last few years. I usually cook with cast iron and seems like there is always a hot handle or lid to touch and small flexible fabric pot-holders work best. The only places I find a floppy fabric pot-holder is at estate or garage sales and they are usually well-worn and pretty ugly when I come across them. Two fresh pot-holders and one old one. 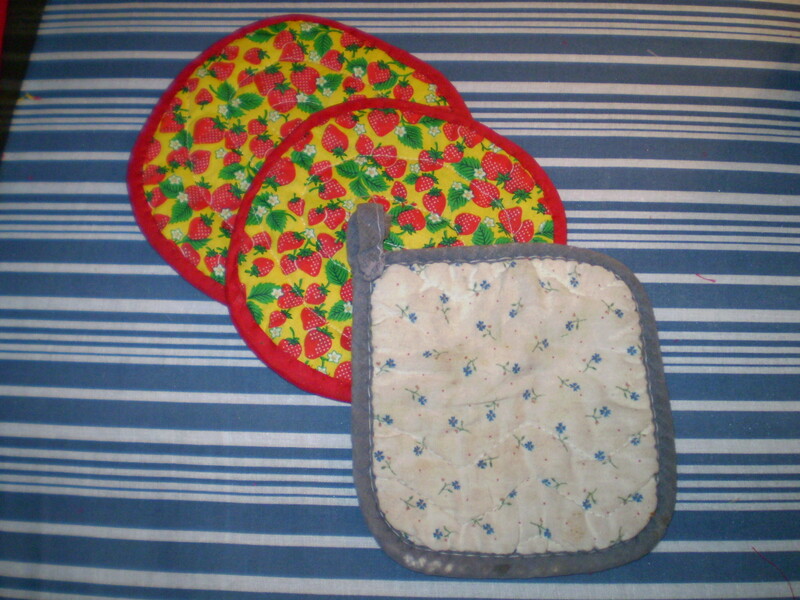 I decided to recycle these old comfortable pot-holders into fresh new pot-holders. 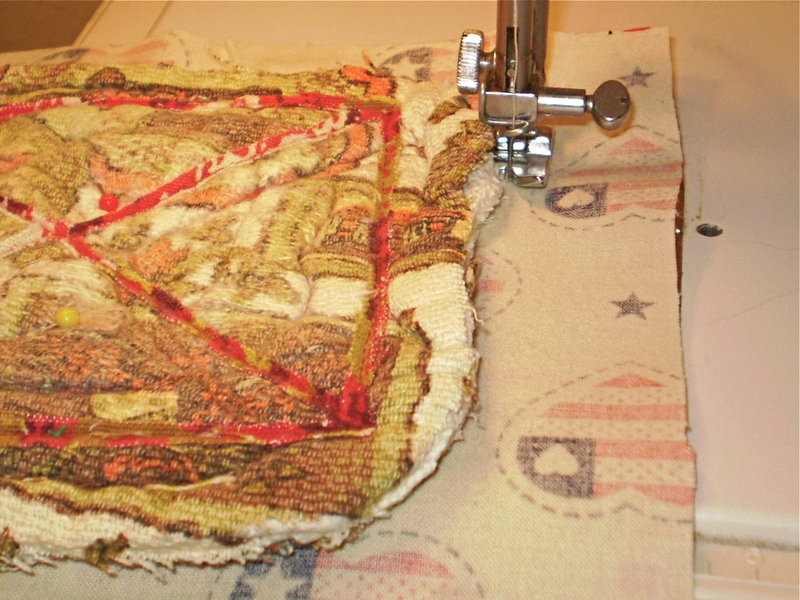 I can use fabric scraps and it only takes 15 or 20 minutes to get the job done. P.S. 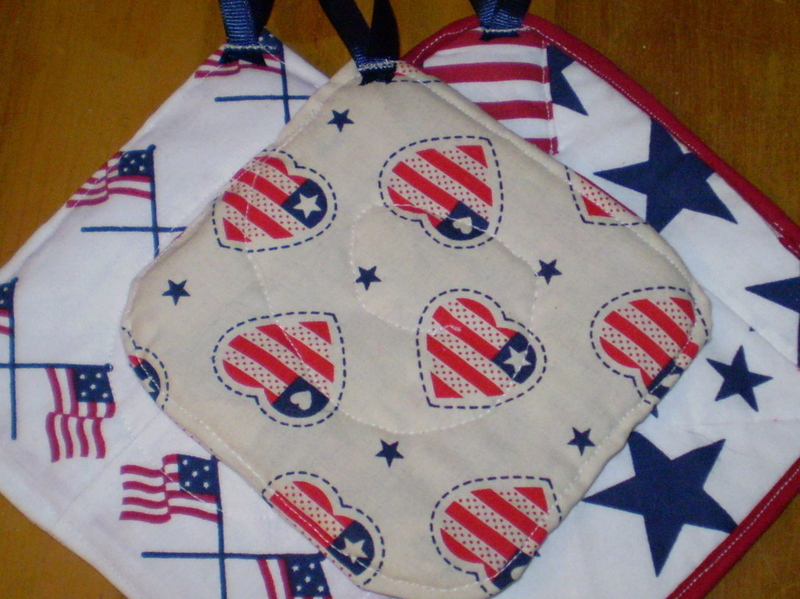 You can make new pot-holders with squares of terry wash cloths or towels. A single bath towel would make a nice bundle of these. They’d be handy to stuff into gift baskets for newlyweds or stocking-stuffers for mom. You could double or triple the layers of terry depending on the thickness of the towel. Step One: Cut fabric a little larger than the pot-holder and zig zag around the edge. Cut two scraps fabric a little larger than the size of the pot-holder. Zig zag around the edges of the pot-holder catching all three layers: the old pot-holder and two layers of new fabric. Step Two: Attach the bias tape. 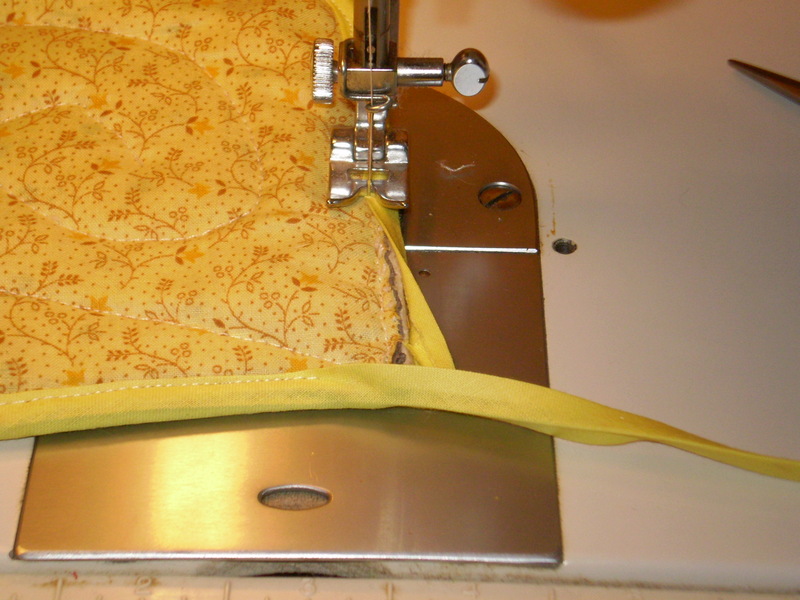 Open up the folded bias tape and stitch inside the crease of the fold. 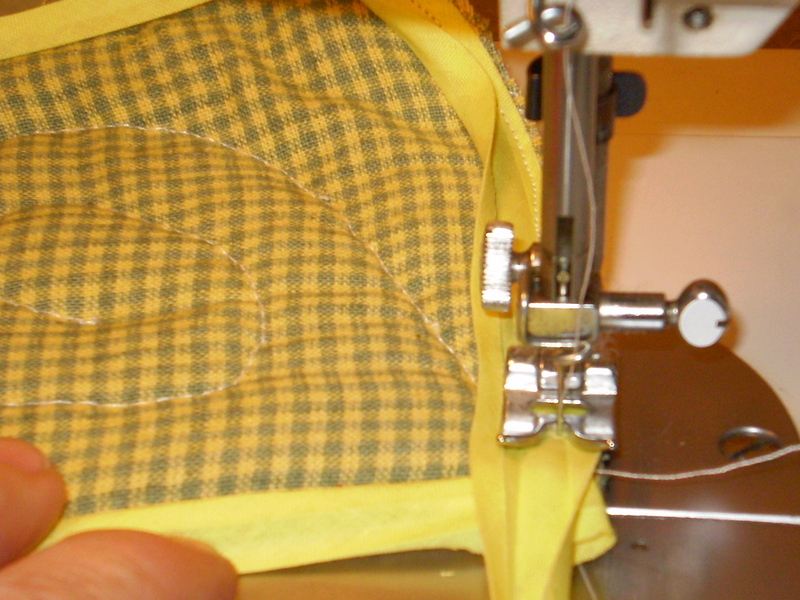 Step Three: Trim the seam allowance as close as possible to the stitching line. In this photo you can see the seam allowance is too wide for the bias tape to wrap around to enclose all the layers. Small scissors will give you more control when you trim the excess seam allowance as close as possible to the stitching line. The corners will need to be trimmed especially close. Step Four: Wrap the bias tape around all the raw edges and stitch in place. Go slow and stretch the bias tape* into place as you go. Use the tip of the scissors to keep the tape from bunching up under the presser foot. If you didn’t start your stitches at the very corner (see photo above and Step Two) you’ll be able to tuck the raw end into the starting fold of the bias tape. 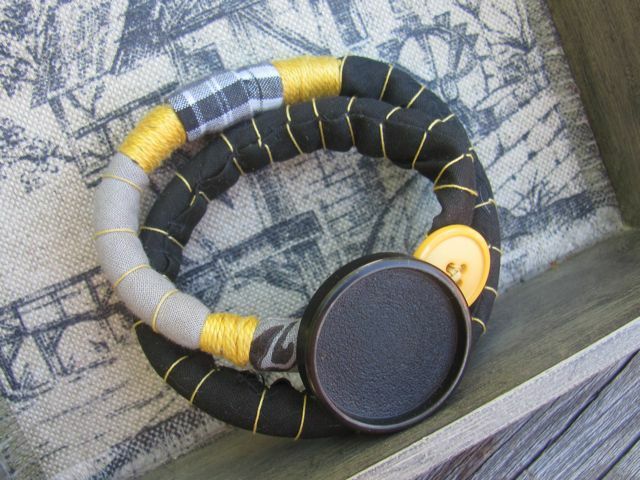 And if you left a “tail” of bias tape at the beginning you can stitch the tape flat and make a loop of it. With the 2–3 inches extra length loop it back to the corner, turn the raw edge under and zig zag it into place. See the finished product below. 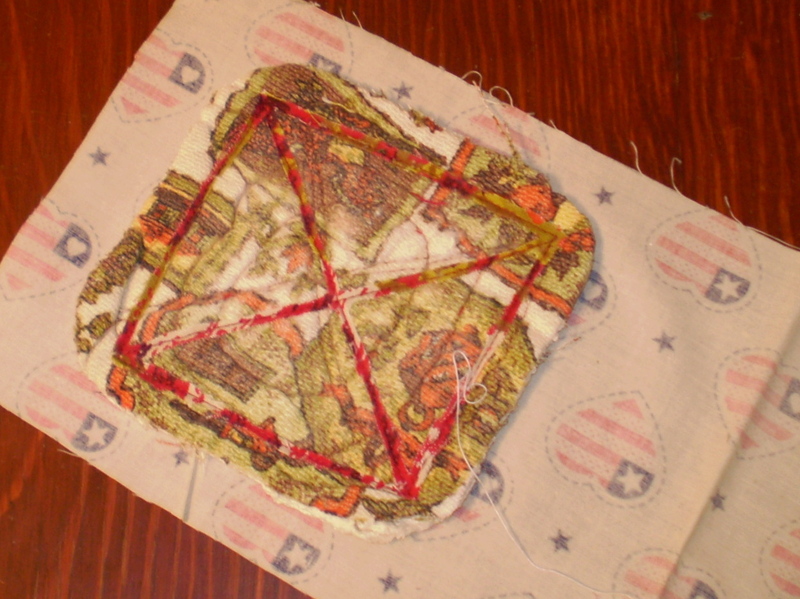 If you want, you can “quilt” all the layers in place by stitching a random line of stitching around the surface of the pot-holder. Here’s another batch I did this afternoon. 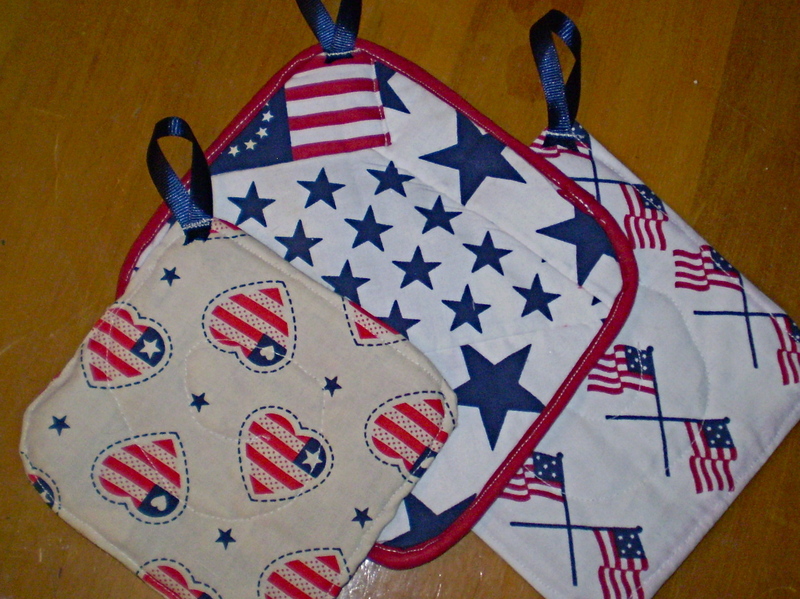 Red, white and blue pot-holders. I skipped the bias tape on two of these and made them like little flat pillows. Easy peasy! Since I wasn’t using bias tape I could use for a loop I made a loop out of navy grosgrain ribbon and zig zagged it onto one of the corners. 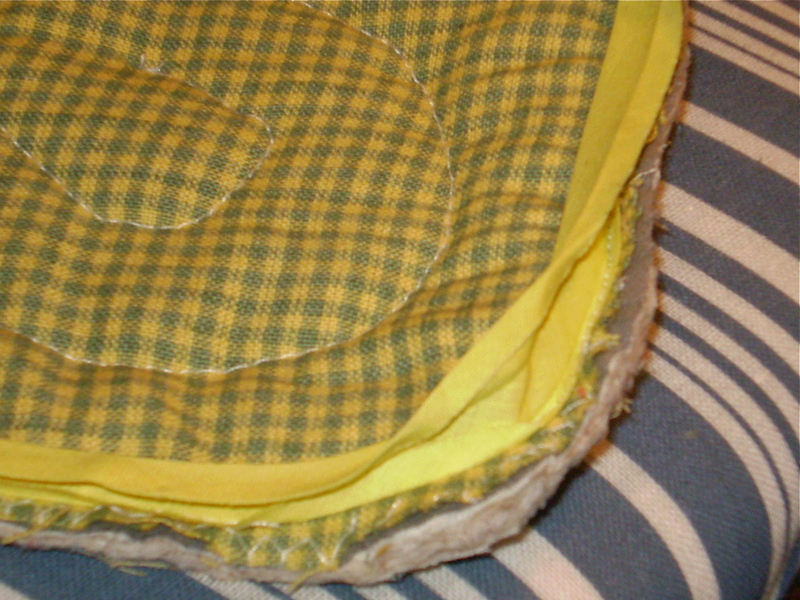 To make the “pillow” version, cut a scrap of fabric a little wider than the pot-holder and twice as long. 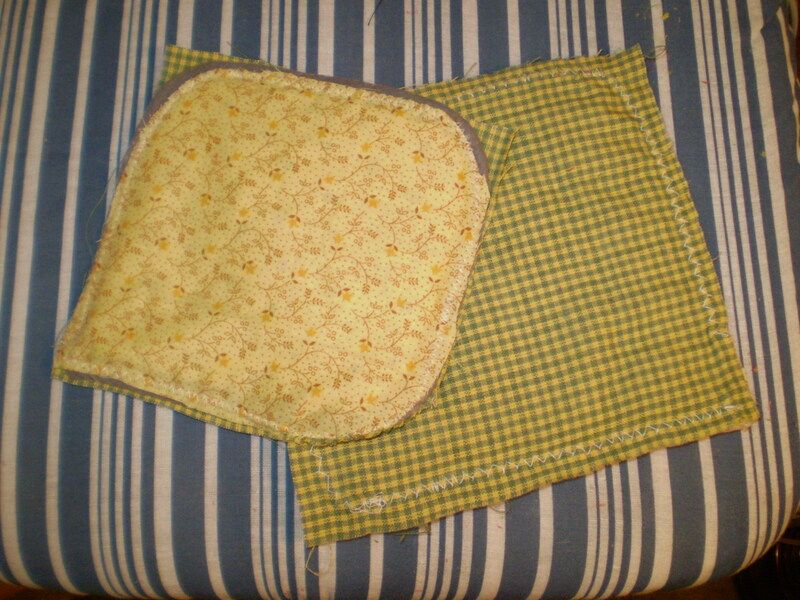 Instead of sewing it all the way around I folded the scrap and only had to sew it on three sides. This pot-holder is extra ratty looking because it had already been recovered sometime in the past. The top layer was corduroy and it would have been way too thick had I left it. I cut off the seam allowance to reduce the thickness around the edge and trimmed as much as I could out of the middle. Step Two: Sew the little pillow to fit the pot-holder. 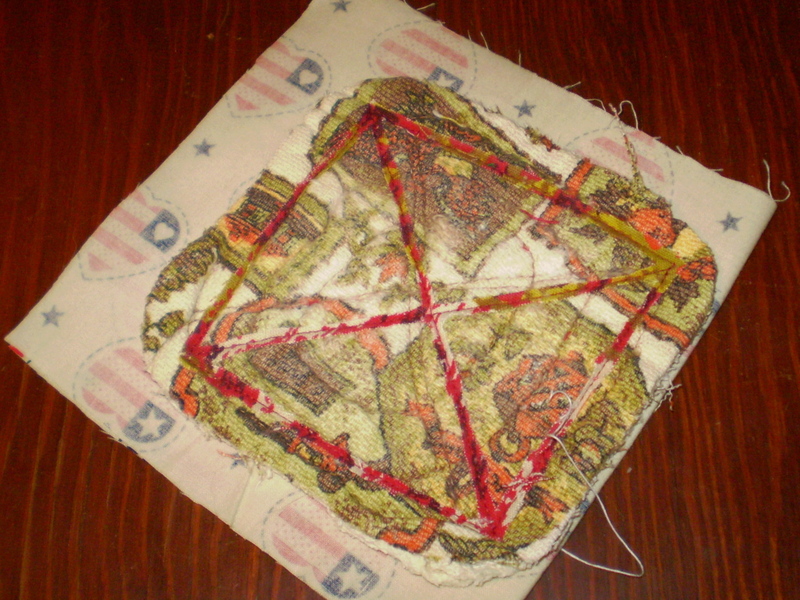 Next I pinned the pot-holder to the new fabric and stitched around it, not catching the pot-holder with this version. I started at the fold, curved around and stitched up the side and then stitched around the curve at the top before stopping to leave an opening. I skipped about three inches and stitched around the opposite corner, down the side and around the curve back to the fold. Turn the little pillow right side out and stuff the pot-holder inside. Step Three: Stuff the pot-holder in the little pillow. Make sure to smooth the pot-holder to fill all the corners inside. Press it and top stitch around all the edges as close to the edge as possible. Here’s another sample of a pillowcase pot-holder. 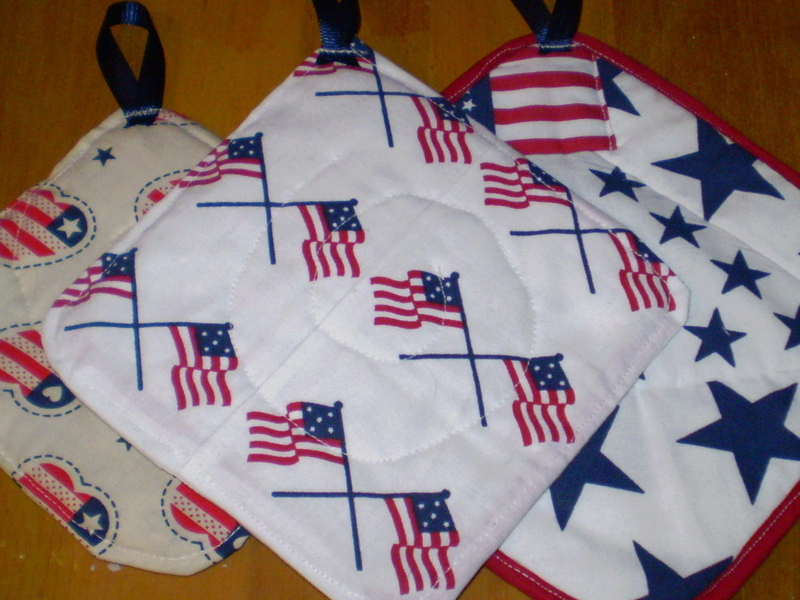 I had a long strip of these crossed flags and I stitched them together side by side to get a piece wide enough to cover the pot-holder. For this one with a primarily white background some of the print on the old pot-holder was showing through. 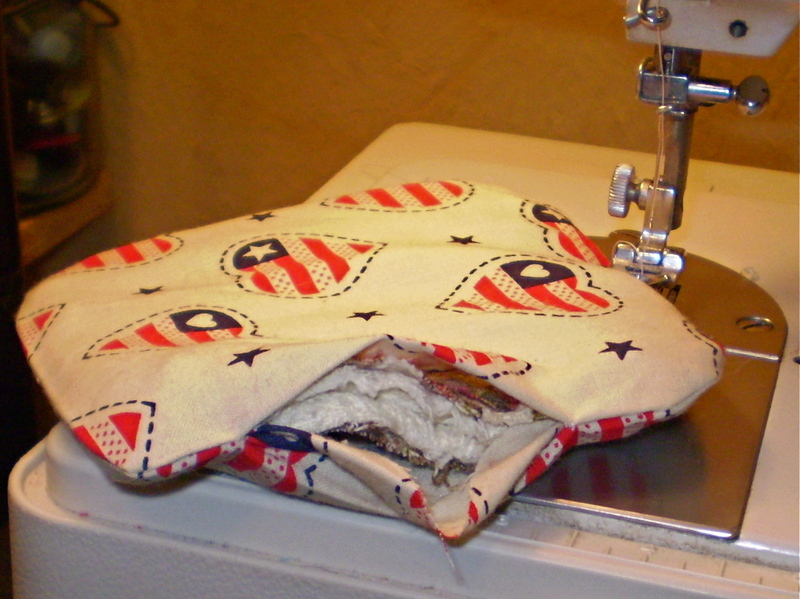 I found a couple of white scraps I stitched to both sides of the pot-holder before stuffing it inside the pillow. You can see a little red around the edges from the bias tape around the original pot-holder. 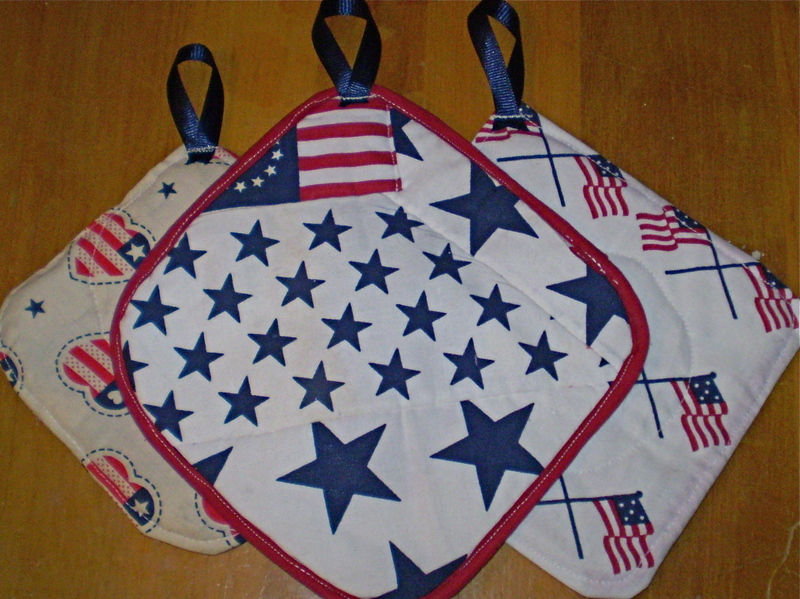 The last scraps of stars and flags were stained in places so I didn’t have a whole piece to work with for the last pot-holder I wanted to cover. I stitched pieces on the top of the pot-holder and tried to avoid the worst of the stains. I started with the large stars across one corner, then added the smaller stars next to it. There was a stain across the end of that piece, so I added a small section of the large stars to cover it. With the remaining bare spot I put a section of a Betsy Ross style print. I found a solid red to put on the back and used red bias tape to finish the edges. I finished it off with the blue ribbon loop on the top. *A note about the bias tape. If you’re new to sewing here’s the lowdown. Bias tape is cut at a 45° angle to the straight grain of woven fabric. This gives it some stretch which will allow you to stretch it around corners and curves without puckering or pulling. 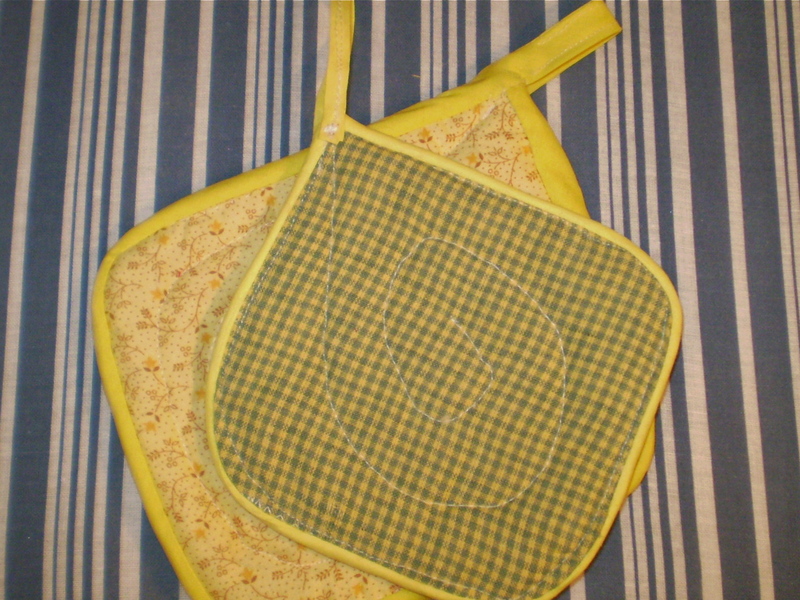 If you’re making a pot-holder with corners instead of curves you can use straight strips of fabric to cover the edges but you’ll have to overlap at each corner. You won’t be able to turn the corners with a continuous strip as you can with bias tape. I have some samples of this if anyone needs more information let me know and I’ll post an example with directions.